Ø Over-stressed epithelium becomes thick and keratinized. 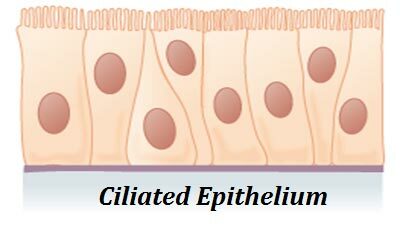 Ø Outer cells of the epithelium quickly fall off due to high friction. Ø In order to overcome the fall off cells, epithelial cells show rapid cell division rate. Ø Epithelial surface may be absorptive, secretory or excretory in function. Ø They may contain sensory cells or nerve endings for the reception of stimuli. Ø All glands are made of epithelial cells. Ø The classification of epithelial tissue is based on three criterions: (1) Number of cell layers, (2) Shape of individual cells and (3) Secretion or cell type. Ø Simple type and composed of single layer of cells. Ø Every cell in the epithelial layer connects to the basement membrane. Ø They are flattened one layer thick epithelium. Ø Cells are very thin (thinner than the width of the nucleus). Ø The edges of the cells squamous epithelium are irregular and clear. Ø Special junctions occur between cells of squamous epithelium. Ø These junctions help to bind the cell firmly to form the layer. Ø Squamous epithelium is mainly occurs in the renal capsules of kidney, alveoli of lungs and the wall of blood capillaries. Ø The thin nature of squamous epithelium permits rapid diffusion of materials through the cells. Ø The squamous epithelium of the blood vessels is called endothelium. Ø The smooth appearance of squamous epithelium in the blood vessels and heart chamber wall allow relatively friction less flow of blood through them. Ø They are less specialized type of epithelium. Ø The cells cuboidal epithelium is cube shaped with a central nucleus. Ø Cells are larger and thicker than that of the squamous epithelium. Ø Cells are pentagonal or hexagonal in outline in the surface view. Ø The cuboidal epithelium may be secretory or non-secretory. Ø Cuboidal epithelium forms the lining of many ducts such as salivary ducts, pancreatic ducts and ducts of kidney. Ø Secretory cuboidal epithelium is found in the salivary gland, sweat gland and thyroid. Ø In columnar epithelium, the cells are taller and narrow in outline. Ø They possess more cytoplasm per unit area. Ø Each cell possesses a nucleus which is located at the base of the cells. Ø The side of the epithelial cells facing to the organ cavity possesses brush borders of microvilli. Ø The microvilli increase the surface area for the absorption. Ø In the columnar epithelial cells of stomach, some cells are modified into goblet cells. Ø Mucus protects the stomach epithelium from the high acidic pH and also from the digestive enzymes. Ø Occurrence of columnar epithelium: lining of stomach, lining of small intestine, kidney duct and in thyroid gland. Ø Here the cells are columnar (similar to columnar epithelium). Ø The cells of the ciliate epithelium possess many cilia at their free surface. Ø They are always associated with mucous secreting goblet cells. Ø Mucus produces the fluid in which the cilia can setup currents. $ Ciliated epithelium occurs in the spinal canal. $ Respiratory passages such trachea, bronchi and bronchioles possess ciliated epithelium. The mucus can trap bacteria and other infective particles and protect it from reaching the lungs. Ø In the sectional view, the pseudo-stratified epithelium appear as stratified (many layered or irregular layered). Ø The appearance is due the difference in the size of the cells constituting the epithelia and NOT due the presence of many layers of cells. Ø Here some cells in this epithelium do not reach up to the free surface. Ø Occurrence: pseudo-stratified epithelium is present in the lining of urinary tract and respiratory passages. Ø Compound epithelium consists of more than one layer of cells. Ø Compound epithelium is thicker than simple epithelium. Ø Two types of compound epithelium occur in animals. Ø It is a compound epithelium formed of many types of cells. Ø Stratified compound epithelium is thicker than simple epithelium. Ø They form tough impervious barriers/boundaries. Ø Many layers of cells in the compound epithelium are formed by the mitotic cell division of the germinal layer. Ø The germinal layer is rest over the basement membrane. Ø First formed cells are cuboids and they pushed upward by the subsequent divisions of the cells. Ø When the cell pushed upward, they become flattened. Ø This condition of cells is called squames. Ø Squames of stratified epithelium occurs in the esophagus. Ø In esophagus, the squames protect the underlying tissue against the mechanical damages by the friction of swallowed food. Ø In some area the stratified epithelium is transformed into dead horny layers. Ø This layer is eventually become keratinized and flakes away. Ø This type of keratinized epithelium is called cornified epithelium. Ø Cornified stratified epithelium is found on the external surface of the skin. Ø They also occur in the buccal cavity and virginal wall. Ø It is a modified stratified compound epithelium. Ø They composed of 3 to 4 layers of cells of similar size and shape. Ø In the free surface, the cells of this epithelium are more flattened. Ø Here the surface cells do not fall off easily. Ø The cells of transitional compound epithelium can modify or change their size and shape when required. Ø This type of epithelium occurs in organs which are subjected to high stretching. Ø Example: bladder, uterus and the pelvic region of the kidney. Ø The thickness of this tissue prevents the escape of urine to the surrounding tissues. Ø They are usually not considered as a separate class of epithelial tissue. Ø They occur in both simple and compound epithelium. Ø Here, some of the cells of the tissue will be glandular or secretory. Ø An epithelium containing many goblet cells is called mucous membrane. Types of epithelial tissue and functions? What is simple cuboidal epithelium? What are the functions of squamous epithelial cells? Differentiate stratified cuboidal and stratified squamous epithelium. Posted in Lecture Notes, Zoology and tagged Epithelial Cells, Epithelial tissue, Lecture notes, Tissue System, Zoology Lecture Notes.